Audio Innovation from the Winner of the UK Department of Trade & Investment's Business Innovation Award. Our CB-01's outer-housing combines aerospace-grade aluminium with luxury wood reclaimed from luxury furniture manufacturers, which would otherwise have been wasted. 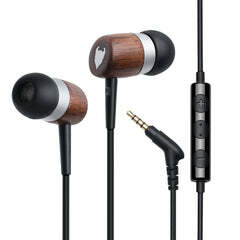 The wood housing provides superior acoustic performance and makes each pair of earphones visually unique. Nanene's incredible properties enabled us to produce an earphone diaphragm that is thinner and more flexible than traditional materials will allow. Independent testing conducted by a leading British premium audio company found that, remarkably, Nanene enhances both the high-end (treble) and the low-end (bass) of the audio frequency wave. 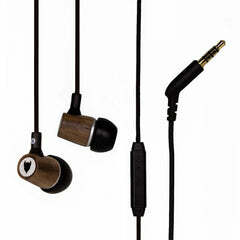 Why introduce Nanene-enhanced earphones at such a low price? Well, we believe that Nanene is versatile enough to benefit both ends of the price spectrum and our CB-01 model brings premium audio to a mass market audience. We have configured the drivers of the CB-01 to produce powerful sound with vibrant bass and balanced musical detail. They punch well above their weight in terms of sound quality. To prolong cable life, we chose a reinforced cable with a 135-degree angled, reinforced 3.5mm connector jack. The lower half of the cable has a braided fabric outer to minimise tangling (the top half of the cable has a plastic outer to minimise noise friction). Nanene is a few-layer version of the environmentally friendly super-material graphene, produced in the UK using a patented manufacturing process. First discovered at the University of Manchester in 2004, graphene is a one-atom-thick layer of carbon that has incredible physical properties. High-purity graphene is widely expected to revolutionise the materials industry, and it can finally now be used in real-world applications. The Nanene standard was established to act as a beacon of guaranteed graphene purity and performance. As with any good quality earphones, it is imperative that you use the correct fitting earbuds. This seals the ear canal and produces a much higher quality sound (it really makes a very big difference).